At BEC Integrated Solutions we offer choices of full or partial replacement intercom systems to upgrade your existing intercom system as well as REPAIRS on Older Nutone and Older M&S Master Units . Whether you desire replacing your system with the same (or similar) parts, or you prefer to consider something with more features and capabilities, we have numerous options available. Our systems can be installed using the same wiring from your previous system as long as each intercom was wired directly to the master intercom station. Upgrade your system with your choice of voice only, video, music, or Bluetooth-enabled intercom to increase security or to simply aid in communication within your home or venue. Whether commercial or residential, we have numerous choices available to suit your needs. Replace an entire intercom system or simply add to it with our various intercom system replacements available. To receive a free, full replacement intercom system quote, simply start by selecting one of the three upgrade options available on the market (listed below). Our pricing is very competitive and we even offer large order discounts when replacing an entire system. Don't wait -- get your free quote today! If your existing home intercom system is giving you problems, it may be time to upgrade your system. Of course, a replacement intercom can bring a lot of questions with it. But before you start tearing wires out of the walls, let’s talk about replacing an existing intercom system. First, wiring is an important aspect to consider in this upgrade. We offer several retrofit intercom systems, meaning that these systems will replace your existing three, four, six seven or eight wire configurations. These upgrades for your home intercom system even come with custom sized adapter plates to prevent you from having patch old holes in the wall. Having said that, there are replacements that need to be made when upgrading your intercom system. Unfortunately, you can’t just buy one piece and have a whole new system. Most systems need to be replaced in its entirety, including the master intercom station, room intercom stations, patio intercom stations, door intercoms, wall and speaker controls, and even the rough-in box or housing that your master station is mounted in. That’s where we come in. 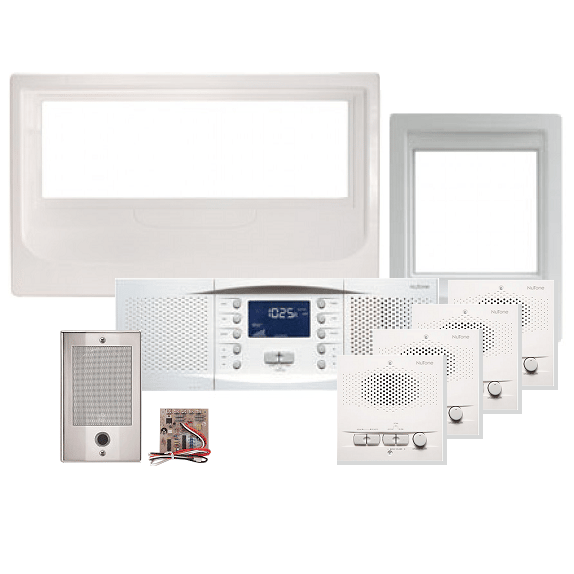 Whether you are looking for a new intercom system or just replacing your old or out-dated system, look no further than the elite line of intercom systems offered through BEC Integrated Solutions. We offer several upgrade intercom systems that can replace existing Nutone, Broan, AudioTech and M&S Intercom Systems. 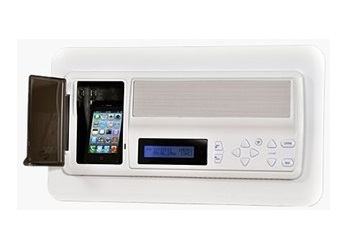 Turn your home or office into an entertainment oasis with this replacement intercom system. As our leading upgrade solution, the RETRO-M intercom system allows you to stream music through multiple input sources throughout your residence. Communication is clear and direct throughout the system and is an ideal replacement for in-wall home intercom systems. The IST RETRO-M can support up to 13 zones for a customized system of 10 room stations, 1 patio station and 2 door stations, for example. The system is compatible with three, four, six, seven or eight wire configurations. This replace intercom system also comes with 10 AM/FM presets and a USB port to charge your device. Bluetooth options are also available, allowing you to go wireless and stream your favorite tunes and audio content. With multiple features you are sure to enjoy, the M&S DMC 3-4 or DMC 1 replacement intercom system offers the latest in home intercom technology. The DMC3-4 intercom system is retrofitted to replace three and four wire configurations and the DMC1 replaces 6-8 wire configurations. The system can support up to fifteen room stations and three door stations. Music streaming is available on the system with eight AM/FM presets and a standard 3.5mm jack when requested for Bluetooth device connection or direct plug-and-play music. 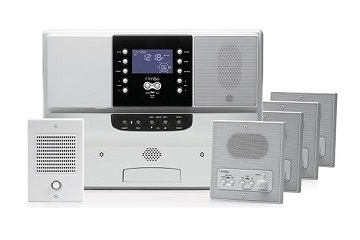 The M&S DMC upgrade home intercom system comes with door chime, doorbell intercom compatibility as well as stereo and optional power amplifier. While only using 30 watts of power, this replacement intercom system will provide the newest features while also keeping operating costs affordable. Enjoy the modern conveniences of 21st century technology with our home intercom system by NuTone. This system allows you to answer the door in any room of your house using door release functions. Simply press a button to communicate with other rooms in the house or even guests at the front door. Playing music is also an option through two different methods. 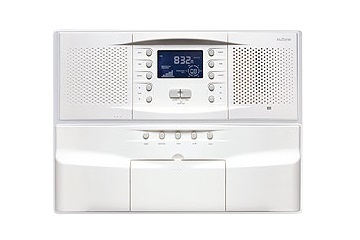 Connect devices using the optional IA-30WH Auxiliary Input or listen using the system’s eight AM/FM presets. All music will come through clearly and supply hours of entertainment! Each of our replacement intercom systems are easy to install and save homeowners time and money by supplying custom replacement adapter plates for seamless installation. When considering a new or replacement intercom system, go with the industry leader for over 20 years. Our systems have been installed all over the world and are known for being the best intercom systems on the market today. Choose system below, fill out a simple form and let us send you a free instant online quote! Below are answers to some of the more common questions we are asked from our customers. Re-using old stations - Unless you have the M&S MC602 model you WILL have to replace ALL room intercom stations and patio intercom stations. If you are replacing a Nutone system of any type you will also have to replace doorbell stations, ceiling speakers and controls. Wiring can always be re-used as long as these wires are home run straight back from each station to the master intercom. This is typically how most old M&S and Nutone systems were wired. Drywall work - Drywall or patch work is not necessary since upgrade systems are designed with adapter plate options. BEC Audio also makes Custom Sized Frames for unique applications. Master unit housing - The rough in box or housing that is in the wall for the existing master unit does have to be replaced when upgrading using the M&S or Nutone intercom upgrade products. If you decide to upgrade using the IntraSonic RETRO-M Intercom you will be able to re-use the rough in housing in the wall as long as it is no taller than 10 inches in height. IPod's, Blue-Tooth, and CD players - We have a few different options for you here. The IntraSonic RETRO-M Intercom Offers a portable music device compartment for iPods and iPhones with USB port for charging. There is also a Bluetooth device option with this system. This system does not have a CD player option. M&S Systems DMC1 & DMC3-4 offers the option to add a single disc CD player / iPod combo unit. This option also has a USB for charge. The M&S Systems also have an option for a six disc CD player (white only). The Nutone Intercom System NM100 & NM200 do not offer iPod iPhone capabilities and the CD player by Nutone has been discontinued. If keeping costs down is what you have in mind but you would still like to play your portable music through the system, we do offer master units with 3.5 mm Jack. Choosing the right Stations - If you have the model number of your existing master unit most of our questions would be answered. If you have an M&S system now, the model number is typically on the bottom right-hand corner of the master units. It is hidden on the bottom of the master unit so you will need to look underneath. You can do this without removing the master unit. If you have a CD player it is likely that this unit would be blocking the model number. If you are replacing a Nutone, the model number is often on the front of the master unit and sometimes behind a closed door on the master. If you have no luck finding the model number you can remove one of the interior room intercom stations and simply count how many individual wires are connected to it. Typically you will see 3, 4 or 6 wires connected. Door Stations - if you are replacing an M&S Systems Intercom with M&S Systems you can always reuse the door station. If you are replacing a Nutone Intercom System you will need to replace this regardless of which product you upgrade with. Ceiling and Wall Speakers - if you have existing M&S music only ceiling or wall speakers you can reconnect these in some cases (if replacing system with M&S Systems) but not all. If you have Nutone music only ceiling or wall speakers you will not be able to read connect these two ANY new upgrade system. 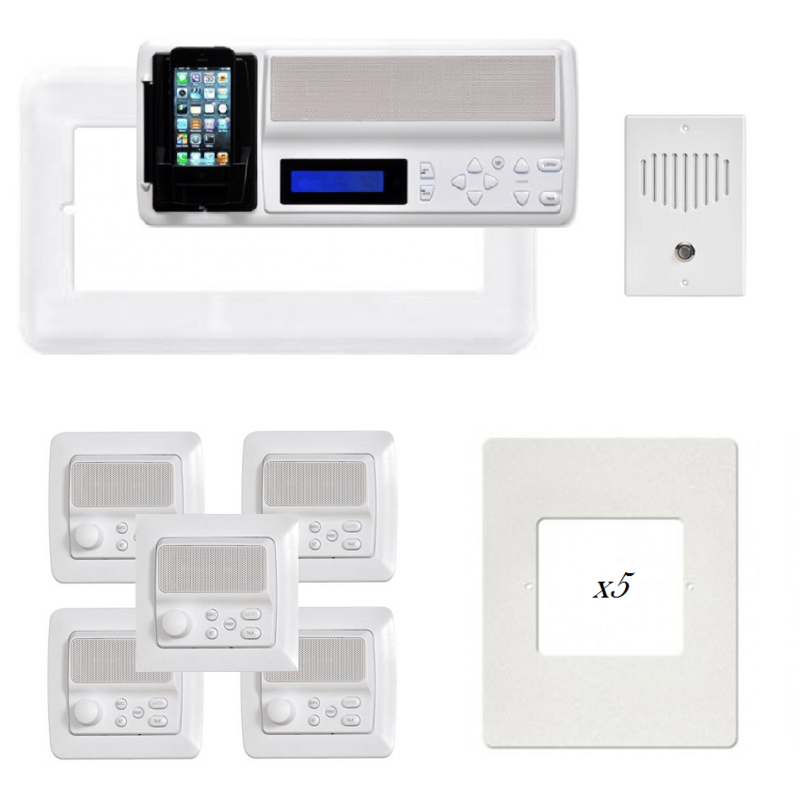 The IntraSonic RETRO-M Intercom Is the only upgrade option that allow ceiling and wall speakers to be connected directly to any room station or patio station. The IntraSonic RETRO-M Intercom does use 8 ohm speakers so you will not be able to reuse your existing M&S Systems speakers or your Nutone Intercom System speakers. However, if wiring is run from the ceiling or wall speakers directly to the room station or patio station you will be able to reuse the wire to install new speakers. You will need to check the size and of the current speakers.